Another great old photo from the Syd Bird archives! 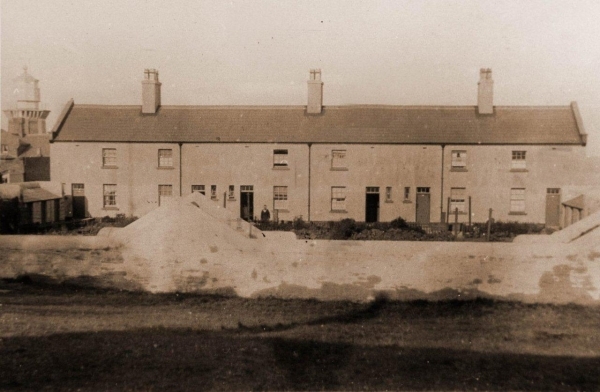 I’ve not seen these cottages mentioned before …they were the coastguard cottages situated where the boatyard/Government Road flats are now behind Hoylake Sailing Club. Syd says that these cottages were also home to the original coast guard station and they were demolished in about 1960 to make way for the flats. You can see in the left of the photo the old Lower Lighthouse. Anything to add? Feel free to comment of course! My 3 x Great grandfather John Hayes was a coastguard around Wirral, Lake Place in 1861 & Parkgate in 1864 . The census says he was at Lake Place in 1861 so doubt he lived in these cottages. Thanks very much for the photo which was fascinating – I’ve seen the engraving before but never the photo. 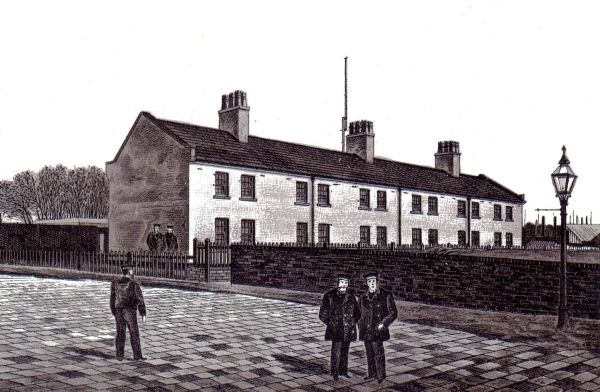 I seem to remember that the cottages were builit in the 1840s after the reorganisation of the Coastguard and also because the North Wirral coast was regarded as quite lawless: their role was ot keep down sumuggling and wrecking as much as saving lives. I’m not sure what the odd structures are on the front wall – some kind of lookout? Thanks – and thanks Syd – these old photos are great. Somewhere i have seen a copy of the artist’s impression with a caption naming the figures depicted – one of them is I believe my G.Grandfather Francis Norie – who I think may have been stationed at Hoylake in the late 1890’s, after, like so many others (I have read) having beeen a Navy man. I think that my Mum may have moved into one of these with my Gran and Grandad in 1936. Grandad was a naval man and this was his first CoastGuard Job. I think he moved to Formby in 1949 when the station was moved there. Would anyone know if I have got this right?. Mum left in 1948 when she married. Any help gratefully received. Wendy it may help people if you could give your grandfathers name and your mum s Christian name it may help jog people’s memories, I remember the cottages used to walk past them coming out of the winter gardens, I don,t remember them being knocked down though. Good luck with your search. Thank you Diane. My Grandfather was Edgar Cable. He was a CoastGuard at Hoylake from 1936 – 1949. My Grandmother was Eleanor Cable. She died very young aged just 49 years. Mums name was Edwina. I am hoping that someone might remember them and have some memories. Mum said that the coastguard cottages had quite big gardens. She remembered the blitz and coming home from a days work in Liverpool to find that the church had been hit and had lost its spire. Any help with my research would be great fully received. I am trying to get a picture of what her life would have been like during that time. my late husband john leslie abraham lived at 4 coastgayrd cottages, They were beautiful cottages ver big inside and the did indeed have large gardens. Today they would have been listed buildings and protected. The were demolished around 1964 as my husbands family moved to 1 government rd around 1965 the year we were married my father-in-law was john abraham a bin man for over 35years. Thanks. Sorry only just seen this reply.was your late husband born there? I have discovered that Mum lived at no 1. Could they have known each other? Thank you so much for post this photo. I’m just looking into my GGrandfather’s service and he was in Hoylake for the 1891 census, having moved from RN to CG in 1889. I’ll have to show this to my dad as he knew very little about his grandfather. My G Grandfather died in 1904 about 6 weeks after moving to Plymouth. My grandfather died young as well so very little has passed down. This photo adds a bit more to his story.